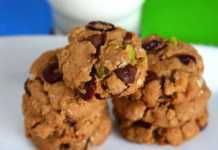 Recently I came across a no flour oatmeal cookies recipe which also used a lot of peanut butter. I was excited for many reasons; I had a huge pack of oatmeal from Costco, a tub of freshly made peanut butter from Bulk Barn and also because it was a flourless cookie recipe. All I had to do was find a suitable egg substitute and I would have made a gluten-free friendly version of these flourless oatmeal and peanut butter cookies. I’m mentioning it as “gluten-free friendly” because all oatmeal is not gluten-free. Although oats in general is gluten-free because it is usually processed in machines that process wheat, the chances of cross contamination are pretty high and this is a no-no for a person whose is highly allergic/intolerant to gluten. Flourless peanut butter cookies are quite popular too. It just uses three ingredients; peanut butter, eggs and sugar. In my early years while teaching myself to bake, I did try to make it egg free but couldn’t pull it off. Maybe with the little experience I have gained all these years baking egg free I might be able to get decent result with the peanut butter cookies without flour too. But until then I’m satisfied with this no-flour oatmeal peanut butter cookies even though it’s not grain free yet. I have already tried a peanut butter oatmeal cookie recipe, but with flour though. I was sort of skeptical about this oatmeal cookie recipe without eggs and without flour. Was reading the reviews for the original recipe and none had mentioned that it was a problem. Everybody had rated it very well. But again the original recipe used 3 eggs and it was definitely enough to bind the ingredients together. But will it work with the egg replacer powder was my question? I wouldn’t know it for sure unless I try it myself. I was thinking maybe I should halve the recipe so that I would not end up wasting the ingredients if I mess it up. But the other me was telling nothing can go wrong and I can fix it somehow even if it doesn’t work out as expected. Thank God I listened to the other me because these flourless oatmeal cookies turned out amazingly well. It was very crunchy initially after it cooled a bit but became chewy later. I think it’s because of the moisture from the dried fruits. Even on the second day these peanut butter cookies without flour were crisp around the edges and soft in the middle but after that the cookies became soft throughout and I’m not complaining at all because it tasted absolutely great. 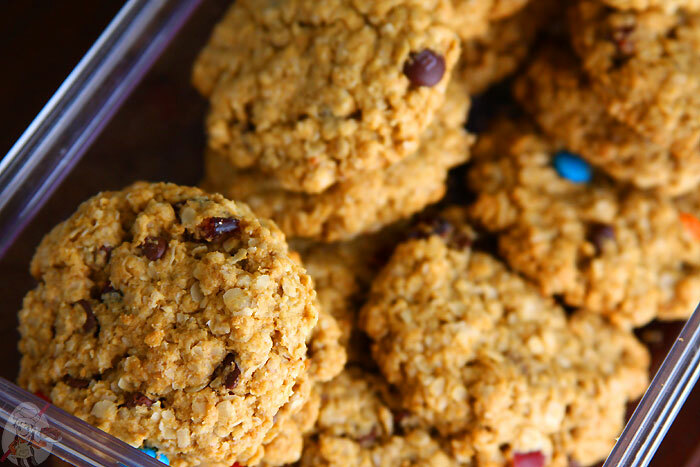 Don’t forget to check out my oatmeal cookies collection. 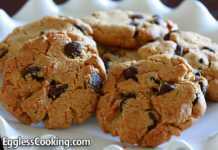 Want to make flour-less cookies? No worries! Try this no flour oatmeal and peanut butter cookies and avoid empty carbs from all-purpose flour. If you want to make it more healthy omit the M&Ms and chocolate chips and just add raisins or any other dried fruits of your choice. Preheat oven at 350F/180C for 15 minutes. In a large bowl cream together the butters and sugars until light and creamy. Mix in the egg replacer mixture and vanilla extract; beat well again. Drop in a tablespoon of dough on an ungreased baking sheet, in inch apart. I flattened the dough before putting it in the oven. Bake for 12-14 minutes. I took out mine after 12 minutes itself. Remove from the oven and cool the baking sheet on a wire rack for at least 5 minutes before removing the cookies from the sheet. Then transfer the cookies to the wire rack directly and let it cool completely before storing it in an airtight container. The original recipe used 4 and 1/2 cups of oats. I felt the batter was not thick enough even after adding the chocolate chips and M&Ms. So added another 1/2 cup of oats. 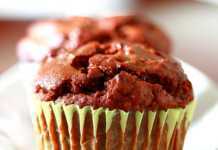 Also the original recipe had used 1 cup of chocolate chips and M&Ms each. I wanted to cut it back to 1/2 cup each and used 1/2 cup of dried cranberries and oats each to make up for the 2 cups measurement. Test baked 3 cookies first without flattening the dough. The cookies did not spread at all. It just stayed as one big lump. So for the remaining cookies, rolled them into nice rounds and flattened it to about 1 cm thickness. The cookies came out perfect. I’m assuming that if you use all chocolate chips and M&Ms without adding dried cranberries maybe the cookies will stay crisp for a longer time. Or maybe some nuts instead of the dried fruit. Will have to try and see. பாக்கும் போது சாப்பிட நாக்கு ஊருது அ அ அ!!!!!. That’s great to know Mike.